Could LG be going all in with curves? Update: Further renders of the LG G4 have leaked, apparently confirming that LG's upcoming flagship handset will come with a curved body. The renders were posted by the Nowhereelse.fr website, which has a decent track record when it comes to accurate leaks of upcoming smartphones. The new renders show that the LG G4 could come with a more subtle curve design than the LG G Flex and G Flex 2, so if you're keen on trying a curved screen but don't want anything too extreme, then the LG G4 could be a good introduction. With the Samsung Galaxy S6 and HTC One M9 out the way it's time to get excited about the LG G4, and we may have just seen our first image of the handset. It's supposedly a press render and it certainly looks professionally done, but according to @OnLeaks who posted it the image is early and non-final, so the actual design may change before launch. But if it stays this way then we won't have much to complain about. Perhaps the most intriguing aspect is that the back appears to be slightly curved, which may also mean LG has packed a curved screen into it, though it's hard to say for sure. The camera looks like it could be quite a change too, as the lens looks a fair bit larger than the 13MP one on the LG G3 - so much so that it even sticks out slightly. Those things aside the LG G4 looks very similar to the G3 from this image. The rear key makes a return, albeit with a slightly different design, and it appears to have a laser autofocus and dual-LED flash just like its predecessor. The back looks very similar too, suggesting that it might be a metallic effect again, rather than actual metal, though that flies in the face of previous rumours that we'd see a metal casing. 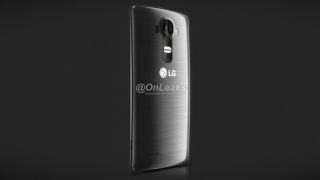 Alongside the render some dimensions were also shared, with the LG G4 apparently coming in at 148.9 x 76.5 x 9.9mm. The LG G3 for comparison is 146.3 x 74.6 x 8.9mm, so if these are accurate then the LG G4 will be longer, wider and thicker than its predecessor. That seems strange given that the current screen front-runner is smaller at 5.3 inches and supposedly has less bezel too. So maybe that won't be the screen it comes with, but whatever display it uses it should impress as it's bound to be at least QHD. We might know the facts soon enough, as the LG G4 is rumoured to be landing in April or May. Could the LG G4 pack a 3K display?